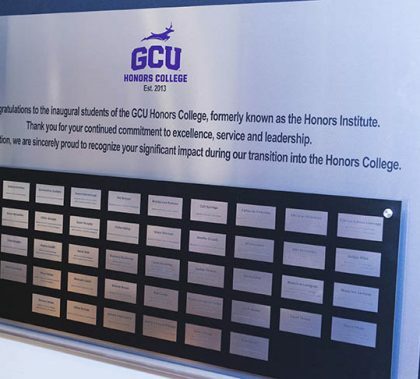 The successful journey of growth and academic excellence inspired a celebration for the Honors College Saturday, recognizing President Brian Mueller for his impact and innovation, the college’s 50 inaugural members, a warm speech by recent graduate Brittany Holen and an introduction of the advisory board and team. Students also were invited to meet two outstanding power couples with perspective on balancing careers and marriage. 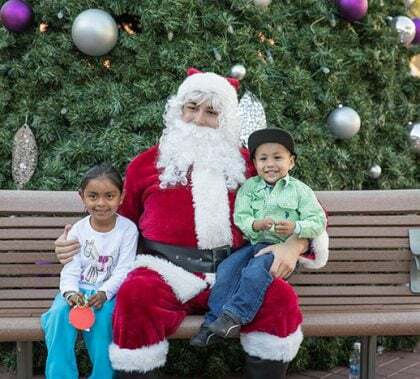 GCU’s Canyon Cares Christmas event Sunday cheered the hearts and filled up space beneath the Christmas tree for hundreds of families who might not otherwise have any gifts for their children. Hundreds of neighbors, staff members and volunteers enjoyed the celebration of giving. Photos by Darryl Webb GCU News Bureau The Grand Canyon University women’s basketball team improved its record to 5-4 by holding off Cal Poly 64-59 Saturday afternoon at GCU Arena. Photos by Darryl Webb GCU News Bureau The Grand Canyon University men’s basketball team improved its record to 5-4 by defeating Illinois-Chicago 73-69 Saturday night at GCU Arena. The Lopes trailed 68-65 before rallying to win. Photos by Emily Saunders GCU News Bureau The Winter Dance Concert is scheduled for Friday-Saturday, Dec. 9-10, at Grand Canyon University’s Ethington Theatre. Here are photos from the rehearsal. 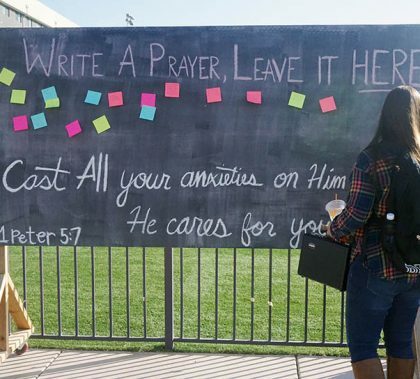 In an effort to help encourage students during finals week, the university’s Office of Student Engagement hosted Fuel for Finals on Thursday. It featured candy canes, warm apple cider and many prayer requests. This week’s edition of Antelope Intros features an associate ice hockey head coach who is all about hockey (surprisingly) and exploring Arizona. The other is an email marketing specialist who shares a special story about how he arrived to GCU. 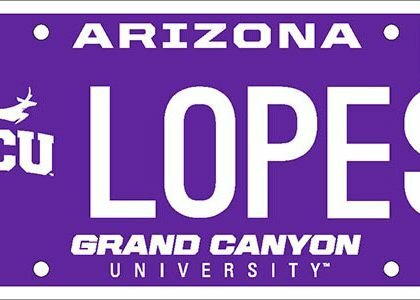 Starting as early as Dec. 18, Grand Canyon University students, alumni, fans and employees will have a chance to show their GCU pride with an official Department of Transportation license plate. The purple plate with a white logo will spread the love of all things Lopes. Photos by Darryl Webb GCU News Bureau The roar in Grand Canyon University Arena was deafening Wednesday night as the Lopes upset San Diego State 76-72. DeWayne Russell, coming off a 42-point game against Louisville, led GCU with 21 points.